•Liquid Nutrients: Studies and common sense have shown that supplements have better absorption and faster assimilation in liquid form. We have carried Liquid Health products in our office for many years and have found them well received by our patients. Our most popular products are the Complete Multiple, Liquid Calcium and Glucosamine Joint Formula. •Pareben Free Skin Products: Recent studying and continuing ed. classes has led me to explore the effects of things we put into our bodies through our skin. Parebens in many forms are widely used as a preservative in lotions, sunscreens and soaps. They are estrogenic or hormone disrupting and have been linked to cause cancer. Begin reading the labels on most of the products we put on our skin and you will find parabens and other chemicals. Even many of our very expensive skin care products will have these chemicals in there. The majority of sunscreens have these and other micronized chemicals that are readily absorbed into our blood stream via the skin. Many of the pain relieving gels out on the market also have parabens in them. Our office no longer stocks pain relieving gels that have unwanted chemicals in them. We have found pain relieving gels, lotions and sun blocks that are paraben free. Feel free to ask us about them. For more information, do internets search on parabens. •Cervical Pillow: As a Chiropractor, I have been asked what I recommend for neck pillows and mattresses while sleeping. Call me to ask my opinion regarding mattresses as it will take a little explaining. I recommend a good supportive cervical pillow for sleeping either on your back or side. Pillow's designed to reduce neck anteriority while on your back yet support the head from the side are most appropriate for our patients. 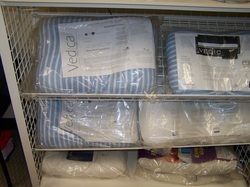 We have been fortunate to find companies that have designed pillows that meet our specificatons both using memory foama and fiberfill.